Creating with Christine: Score a Perfect 10 with Studio J! 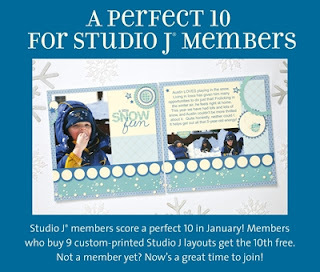 Score a Perfect 10 with Studio J! This month all Studio J members can win BIG! For every 9 layouts you purchase, you get the 10th FREE! So with 18 layouts you get 2 more FREE! And so on! Not a member yet? We can fix that! Members save more, do more and get more! Members-only promotions like this one! Studio J is our fantastic online scrapbooking software that allows you to create beautiful 12x12 layouts in just minutes! It's the easiest, most economical way to get caught up on your scrapbooking, or create a theme album of a special vacation or event. Are you interested, but feel like you need an introduction or some hands-on help? Or are you already familiar with Studio J but want to learn even more? Come to my Studio J Crop on Saturday, January 14 from noon to 4pm. Come part of the time or the whole time. I've recently installed an internet booster, so our connections should be strong. I can host up to 8 people at one time. And of course I'll have snacks to keep your energy up while you work away on your layouts! I've actually done 20 layouts in one day! PLUS - for every 9 layouts you order from me in the month of January, you will be entered into a drawing for a FREE Studio J 5-pack! A $55 value that you can use for yourself in the future or give as a gift! You don't need to be present at the crop to participate. Anyone who orders Studio J layouts from me in January will be entered to win. I will draw the winner on February 1st. I hope you win!! Sneak Peek at NEW Products! Last Chance before they are gone!